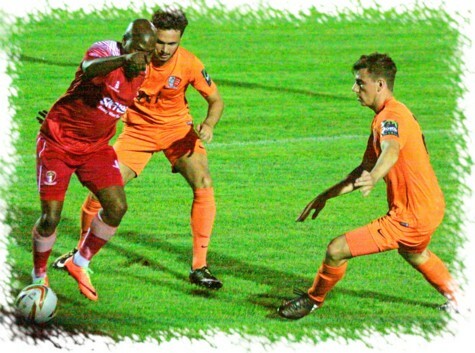 Hayes & Yeading needed an extra 30 minutes at the SKYex on Tuesday evening to finally move into the next round of the Emirates FA Cup after yet another 3-3 draw against Maldon & Tiptree, you cannot say these 2 teams don’t entertain! With both sides missing key personnel courtesy of injuries picked up on Saturday, it was United who struck the first blow on 10 minutes when Joakim Ehui received the ball on the right of the box from Rohdell Gordon, the wing-back cutting the ball back from the bye-line to Josh Chamberlain who fired home from just inside the box. United tried to push further with the advantage and soon afterwards, a long pass by Danny Blanchett perfectly picked out Joakim Ehui on the flank, he fed older brother Ismael who in turn switched the ball into the path of the on-coming Rowan Vine, the striker’s shot just clearing the Jammers crossbar. 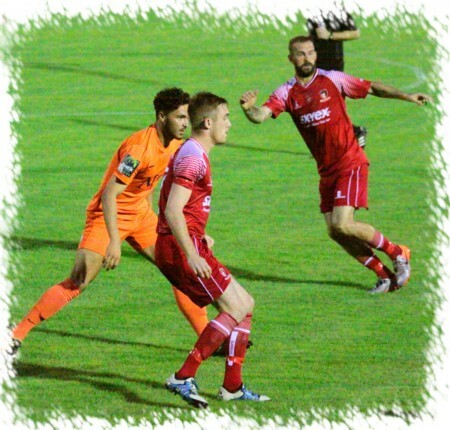 Vine forced another opening minutes later when he outpaced his marker only to be denied by Jammers ‘keeper Andy Walker who blocked his shot away. Just before the half hour though the visitors from Essex got themselves level. Johnville Renee collected a pass inside the box and instantly picked out Suliaman Bah just outside the six yard box, Jack Smith did very well to keep out his first effort but could do nothing to keep out the close range volleyed follow-up by the same player. Far from being discouraged by the Jammers equaliser, United continued to push for more, and more duly arrived before the break. The lead was restored on 37 minutes by as direct a route as you will see, Jack Smith’s long clearance just cleared the centre of the Jammers defence, Vine ran on past the turning defenders before slipping the ball past Walker. A minute from the break United were to extend the lead with Ismael Ehui collecting Chamberlain’s miss-hit shot before curling the ball beyond Walker into the far corner. The visitors re-shaped for the start of the second half by switching to a flat back four and this approach was to pay dividends fairly quickly as they got back in the game within ten minutes. United actually went close to a fourth first as Gordon’s free-kick from wide on the left skipped past all and sundry only to be pushed away by the diving Walker. The Jammers pulled to within one of United in the 53rd minute when Ryan Clampin broke away on the left, he outpaced Joakim Ehui before crossing low to former United striker Junior Ogedi-Uzokwe who beat Smith from close range. The Jammers were now in control of the ball for the most part, Ogedi-Uzokwe received the ball in the box only to be denied by an excellent sliding block by Blanchett as he shaped to shoot. As we moved in to the final fifteen minutes, Alfie Rowland broke on the left and crossed to fellow substitute Kieran Bailey, Smith getting down quickly to gather the ball in. 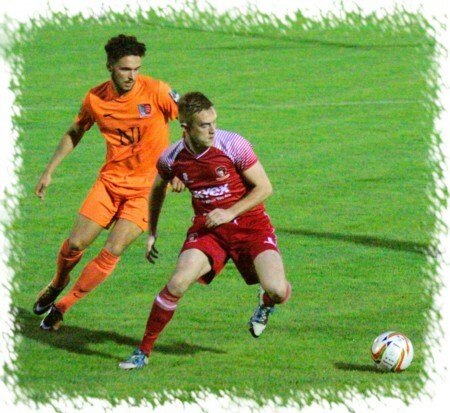 Ten minutes from time Spyros Mentis met a Chamberlain centre but his header was off target and then with just two minutes left the Jammers earned a free-kick 20 yards out, skipper Matt Lock stepped up but could not keep the effort down. Into stoppage time we moved and the Jammers were again awarded a free-kick in a similar position, this time Renee took the kick, beat the wall only for the ball to come back off the post to Kieran Bailey who nodded it back across the six yard box to full-back George Keys who thumped it into the roof of the net from close range to force extra time. With many pairs of tired legs on show by now and the rain blowing across the pitch, the first chance fell to the visitors, Smith doing well to tip a Renee drive over the crossbar just three minutes in. Still the visitors pushed and at this time looked the more likely to break the deadlock. Keys picked out Ogedi-Uzokwe in the middle, his header being blocked on the line by Matthew Hall who then cleared the danger and this was quickly followed by Bailey pouncing on a loose ball on the edge of the United box and forcing another save from Smith who pushed his drive away to safety. What was to be the blow that finally ended the visitors resistance came just ten minutes before a penalty shoot-out. Chamberlain curled a dangerous free-kick into the Jammers box, a defender inadvertently headed the ball back across his own six yard box and as he had on Saturday, defender Harly Wise met the ball and slotted it past Walker. With a minute to go United could have had a fifth when Gordon collected the ball from Frankie Jones and broke away, he was held up on the edge by retreating defenders before feeding the ball back to Jones who saw his effort blocked away however the final whistle blew minutes later and it’s United who will make the trip to “Bucharest” in the next round to face FC Romania.